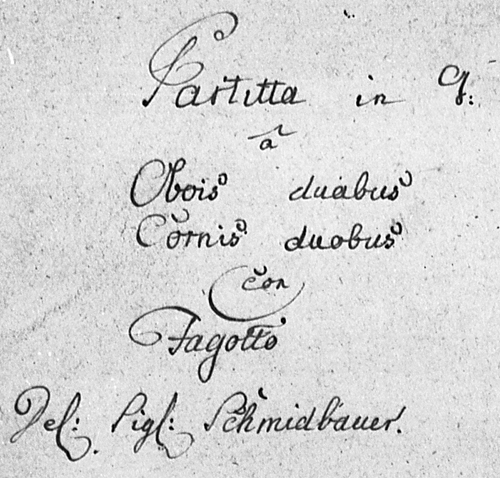 Despite the name of the composer being spelled "Schmidbauer" on the original title page the composer of this Partita was almost certainly Joseph Aloys Schmittbauer (or Schmittbaur). He was born in Bamberg on 8th November 1718 and died shortly before his 91st birthday on 24th October 1809 in Karlsruhe. During his life he was a Konzertmeister and Kapellmeister in places as diverse as Wrzburg (at the Rastatt court), Karls-ruhe and Cologne. In the latter city his introduction of similar orchestral methods to the Manheim style had a lasting effect there. As well as his musical directing he was also a manufacturer of glass-harmonicas providing improvements to that curious instrument by increasing its range. He finally retired in 1804 eventually being honoured with the title Oberkapellmeister; his son Ludwig Joseph taking over his place. 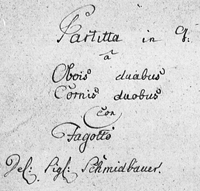 Throughout his long life Schmittbauer was a prolific composer of choral and instrumental music. He was well known for his mass for the Dreikonigfest of 1776 in Cologne as well several works for the stage: including the serenatas Endymion and L'isola disabitat. Of his instrumental works it is worth noting that his quartets for flute and strings were for a time attributed to Haydn. Among his chamber works were 7 divertimenti and partitas for a variety of wind instruments. This Partita in G (and that in D) belong to that set. They are both works of modest length, and their reason for being composed is not clear but possibly they were, like much of the wind music of the time, written to accompany some informal occasion.